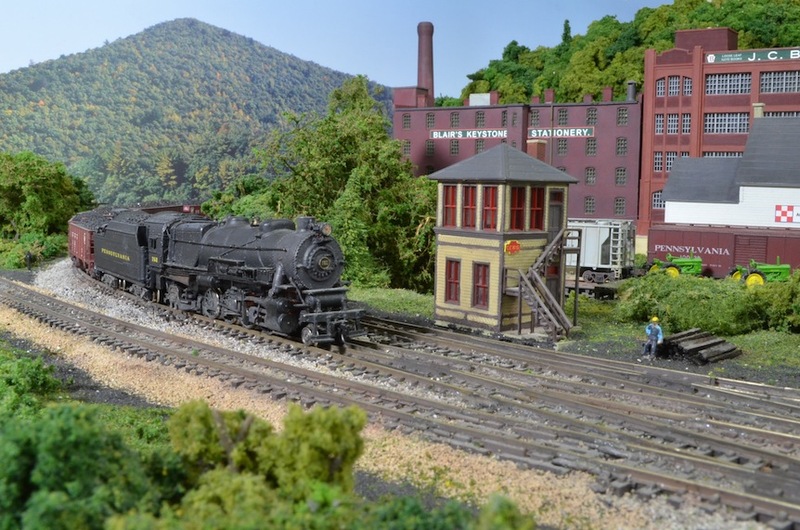 A PRR L1s class 2-8-2 passes LEWIS Tower on an abbreviated version of the PRR’s 4-track Middle Division mainline. 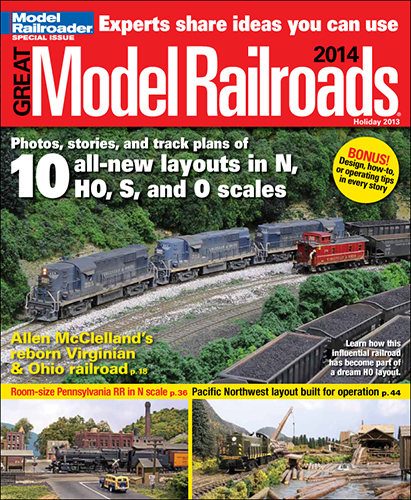 There’s been a lot of traffic on the Railwire lately about modeling Penn Central. The vast majority of my Penn Central equipment exists to represent ex-PC Conrail equipment circa 1980, but the Kato PC passenger set was a purely PC-era item I couldn’t resist. I’ve since been adding to the collection of pure PC stuff, including locomotives, and recently a cabin car. Inspired by the recent surge in PC modeling by friends and peers, I decided to cobble together some stuff that was close to era-appropriate for 1971 (barring the late 70s COTS and wheel inspection dots on some of the cars appropriate for my 1980 era) and make a movie. One snafu was that when I re-painted the road surface, I bumped the US 522 sign and turned it 90 degrees… something I didn’t notice until the movie was done. Although Amtrak is already a few months old, the first train is a purely Penn Central westbound passenger consist pulled by an ex-PRR E8 with a B60b baggage car still wearing its Pennsy paint. Later, a lone PC GP7 with the Lewistown local rolls eastward from Huntingdon. It rained all day today to the point of Flash Flood Warnings… Outdoor fun was out of the question, and any painting project would be complicated by the humidity. I had a few cab signal boxes to install on some of my Conrail GE locomotives and I also needed to make some adjustments on the trucks on a Bachmann Amfleet coach. Once I was done, it seemed like a good day to make some more movies, particularly since a few folks have commented on wanting to see some of my early Amtrak stuff. Sunday afternoons, especially when dry (a rarity in Florida), are a good time to trot the airbrush and compressor out to the back porch and weather some equipment. Today was one of those days where I should have surrendered at first spray, but I’m a Vollmer, which means I’m stubborn as hell. Casualty #1: I had a Trainman 40′ PC insulated plug-door boxcar I’d planned to make look really nice with a fade coat and some good weathering. Step one was cutting down that horribly tall Trainman roof walk, sanding it thin, sanding the roof supports down, and gluing it back on. So far so good. The next step was to mask the yellow sides and mix up some Poly Scale PRR Maroon for the roof to blend it back together. Man, I should have just brush painted it. I had seepage under the tape. So, in order to remove the maroon paint from the yellow sides, I lightly wiped the sides with a brush dipped in Testor’s airbrush thinner. I’ve done this a hundred times. This time, however, the factory lettering wiped right off. 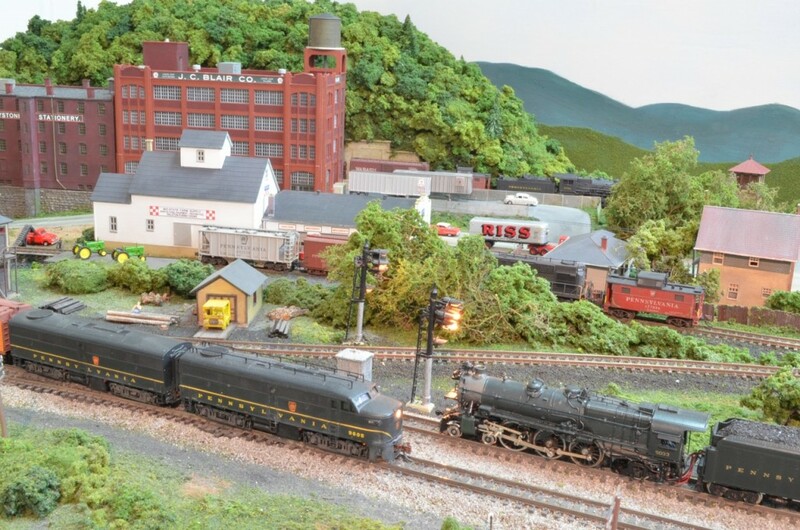 I managed not to kill my other two projects today, which is good, since both are considerably more expensive… An Eastern Seaboard Models PRR X58 boxcar and a Trainworx 85′ TTX fish belly TOFC flat. Having recently (temporarily) removed all of my PRR stuff for Conrail, I felt like it might be time for another movie. One of the great things about movies is that you can control the camera and viewing angles so as to make the layout and the trains all appear much bigger than they really are. Per most of my recent movies, I chose some music appropriate for the era… Technically Talking Heads’ Once in a Lifetime dates from early 1981, but I’ve always liked it, and I think it fits. The train sounds are just from various YouTube videos trimmed to fit. The intermodal flats are really quite long for N scale. They’re about as long as an HO standard boxcar, so they look a little awkward even on my 15″ radius curves. Again, though, camera angle to the rescue… Low angles make the curves look less severe, and significantly increase the apparent power and heft of what in reality are dinky little trains. Oh, yeah, meant to mention… All of this was shot with my iPhone! 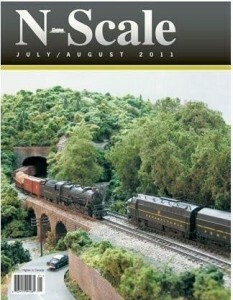 This is a video of a clinic I gave at the 2011 N Scale Enthusiast National Convention in Harrisburg, PA. The video was filmed and edited by David K Smith, one of the hobby’s most talented and prolific modelers, and the proprietor of NZT Products. I was invited to speak on the subject of maximizing a small layout. Enjoy! Last week I reported on my Digitrax DT400 Super Throttle dying after 6 years of faithful service. Ian MacMillan mentioned Digitrax’s throttle repair policy to me, and man, what a deal it is! Even though the DT400 is out of production, Digitrax charges a flat rate of $25 to repair any throttle. So, what would have been at street price a $160+ replacement out of pocket was a mere $25 and 10-day turn-around (including shipping both ways). In fact, my DT400 came back to me with the locomotive addresses I’d been running still selected! Thank you Digitrax, for great products and great service!!! Few items go directly to my layout without some sort of treatment. Most things out of the box have a plastic sheen to them that screams “toy.” Some new models, however, come with a beautiful matte finish that looks very realistic. However, most of those models have shiny pad-printed lettering applied. I use a product from Testor’s called Dullcote. It kills the sheen on any surface (although be careful, it reacts with isopropyl alcohol or CA glue to form a haze) and is probably Patricia’s least favorite smell. I use it outside. Typical of what I do to a “new toy” is what I did today with a Bowser Penn Central N5 caboose I got on clearance at M. B. Klein’s in Cockysville, MD. 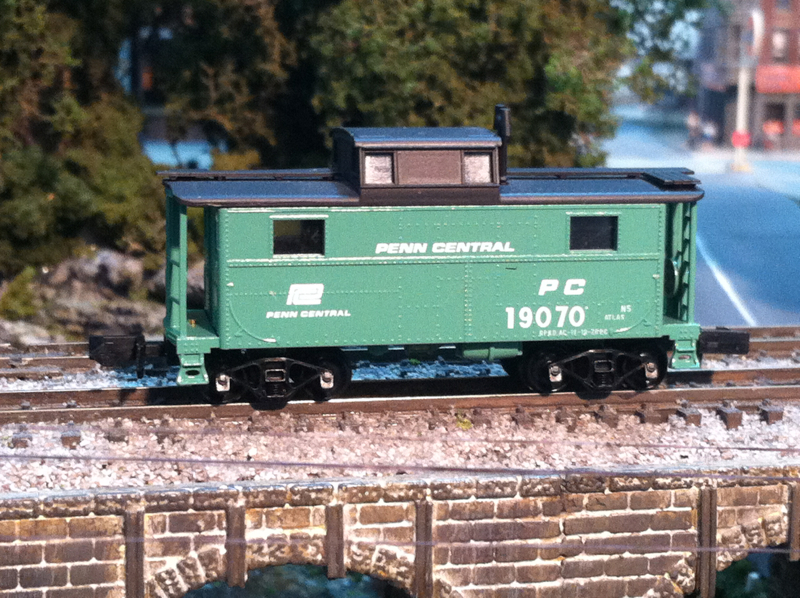 The lettering scheme is not correct for the real Penn Central 19070, but it looks cool enough. Take a closer look at the car, and you can see a lot of things that need to be corrected. Start with the couplers; these Bowser cars still come with ancient 1970’s-era Rapido couplers. Note too the glossy sheen. Students of the Penn Central will also note that the handrails and steps should be yellow. Lastly, there is no ACI barcode plate, which was used between 1967 and 1977 to track railcars. Penn Central existed from 1968 to 1976, so all PC equipment should have ACI plates. Penn Central class N5 shown "before." I started by replacing the couplers with Micro Trains knuckle couplers. I used a light wash of Penn Central Green to add a slight fade. I used MicroScale decals to add ACI plates and a COTS (Clean, Oil, Test, & Stencil, circa mid-70s), and then shot the car with Dullcote (I slipped the glass insert out with the roof to avoid “frosting” the windows). I used a paint pen to paint the handrails yellow, and painted the steps with Poly Scale CSX Yellow. The trucks and wheel faces were painted Poly Scale Railroad Tie Brown. I then weathered the car with acrylic craft paint washes. 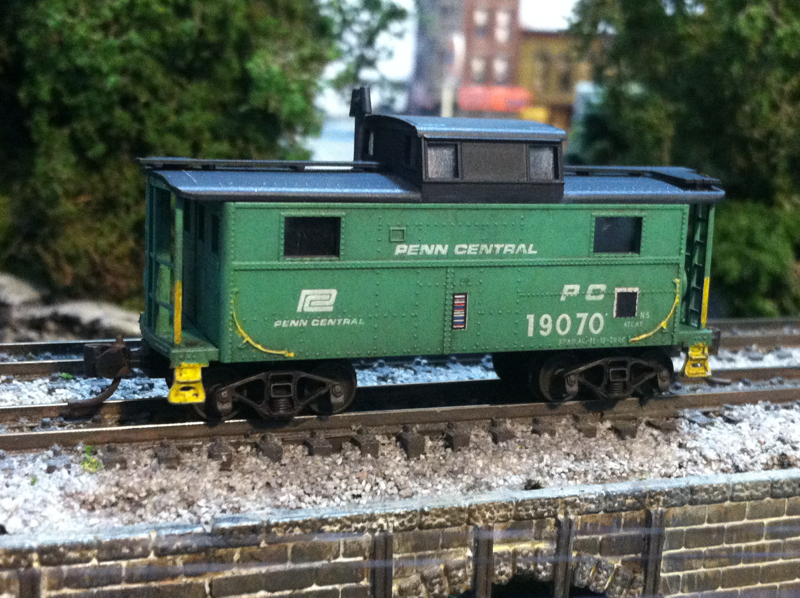 Penn Central N5 caboose... "after." While the result is a tad incorrect from a lettering position standpoint, the overall effect is typical of Penn Central cabooses at the time of the Conrail merger.